How to Change Presentation Resolution in Microsoft PowerPoint 2013? This article will explain how to change PowerPoint presentation resolution in Microsoft PowerPoint 2013. Microsoft PowerPoint 2013 supports the user to select resolution for the ppt file from the different resolution option which the user can select one based on the system configuration. 2. In the Set up Show Dialog Window, verify the “Slide show monitor” in the “Multiple Monitor” group to be selected as “Primary Monitor”. 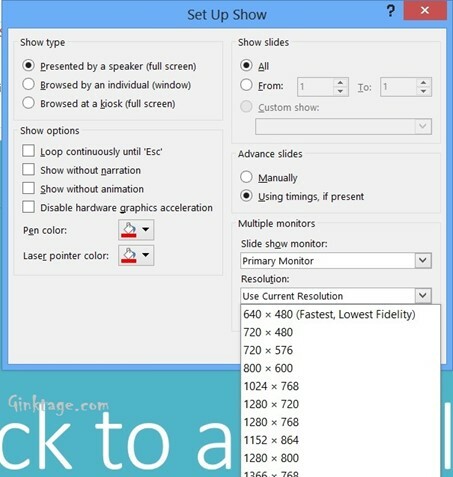 In the Resolution DropDownList, select the resolution and click OK.